I went to Hong Kong a couple of days ago. Nowadays in China, I have experienced more capitalism than I was in the US. In almost all the conversations I had here, people talk about money, money, and money only. commercials are all over. All the peoples here have involved in this life long vicious competition of money making. If you can't win, you will fall into cracks. I feel so overwhelmed and tired. What about art? what about morality? Nobody cares. I feel this society is so off the balance. It is very scary. I have not given up yet. I am still looking for true friends who I can share art and something I consider more important than the all mighty money. You may not know what I mean if you see the title of my today's post, but you must has seen some very cheap original oil paintings selling in hotels, shopping malls, or even on the street. Have you wondered where all those paintings come from. Well, Here it is. Da-Fen-Cun is the place where the main business here is mass producing oil paintings. Many studios in Da-Fen-Cun hire young people with very low pay, and provide basic art training, then produce oil paintings as assembly line. I visited Da-Fen-Cun yesterday. Took a few photos and chatted with several artists. It is amazing how art is produced here. I was on my way to the railroad station, and I saw this special vehicle. I call it RV, but it is not relevant at all to what we call "recreation", because it does not amuse me at all, only sadness . This man modified a small junky pickup truck with whatever material he has. I saw a chimney on the upper rear. He must have a coal burning stove inside to keep him warm in this -15C winter night. The red banner on the side of the vehicle says: "My dear wife, where are you?". I don't know this guy is homeless or not, but he must have all he has on this RV and travel all over the country looking for his wife. Like all the people in this modern society, I was in a hurry all the time. I quickly snapped this photo and rush to catch my train. However this image just cannot be erased from my mind. I don't think this guy knows what the Christmas is, but I sincerely wish him merry and happy, and find his dear wife in the near future. Beijing is cold, very cold now (-15 C tonight). This photo was shot after the 2nd snow storm after I arrived here. I don't see any snowplows to clean the road and anyone use snow blowers. I saw quite a few snow sweepers cleaning the road with those giant brooms made of bamboo stems and leaves. This scene brought back some of my childhood memories. People swept the dirt road and snow with the big brooms like in this photo, leaving beautiful and calligraphic brush strokes on the ground. I was very impressed by their "art" work. It is highly possible I was influenced subconsciously by the giant broom marks, and now they are shown on my canvas. Tonight I will take a 24 hour train ride to Shenzhen and Hong Kong. I will keep you posted what is going on there. "On a Beijing Street 4"
I want to thank all friends sending me emails and comments concerning my father's sickness and difficult situation of my mother and me. Your message really warm our hearts. We are very touched, and happy to know so many people are care and supportive. My father's condition is stable, and our maid came back two days ago. She is very helpful, so I have more time to paint and doing other things. I continue on my Beijing cityscape series. My today's painting is another Hutong scene. I really like using palette knife now. My texture variation is still very limited, but I became more comfortable and freer. The subtly and drama of the painting are improving. "On a Beijing Street 3"
I have been back to China for about a week. I did not go anywhere since my father needs attention all the time. We have a living-in maid to take care him and other chores, but she happen to be off for a while to take care of her own family issues. My father has lost the control of his body. He does everything in bed now. Being sick for a long time, he became very very skinny. I can see his skeleton very clearly. All I have learned from human anatomy study has demonstrated vividly right in front of me. Lying there with pain and all kinds of problems, my father now is the best teacher showing me about life. I feel sad, shocked, and frustrated. Human suffering is inevitable. No matter how rich and famous we are, we never can escape from aging, sickness, and death. The colorlessness of my recent paintings did show my current feeling. On the other hand, my father has also shown me that the time is very very short. I will just like my father or even worse in the future not long from now. I better not wast any minutes I have now. Our maid is coming back soon. I hope our life will get a little better then. "On a Beijing Street 2"
Continuing on my Beijing cityscape experiment. I used a lot of knife work on this one. I kind of like this water based oil colors. They are very different from acrylic colors. They dry very slow, and they have no oder at all. I have established a small painting station in my bedroom. Because there is no ventilation and I can not open the window, I decided to use water mixable colors to minimize the oder. I didn't bring full palette of these kind of colors with me, so I decided to do a monochromatic one. Since I am here in this very old city, I want to try to paint some local landscapes. Houses in old Beijing has a very special courtyard design. They joined together forming many narrow allies (I mean narrow streets, but don't know how to spell). The gate of the courtyard has many different styles implying owner's social status. My painting for today shows one of them. Since color is not a issue here, I want to explore the texture presentation like the brick walls and tiled roofs. I used more knife work and thick paint. I hope soon I will have the freedom of this kind of painting style. It has been snowing during the night. I saw this scene in the morning. Beijing is a very busy big city, even in this cold snowy day. Cars are all over. The traffic is always in jam. Like all the pedestrians, I waded through the semi thawing sludge, trying to keep my balance on the slippery and grey world. My previous blog post was misleading. I am so sorry. I am in China only temporarily. I did say "Goodbye America", but I didn't say "Farewell America". I have arrived at Beijing last night. I am here visiting my parents, and I will spend the holiday season with them. My father's Parkinson's disease has getting worse. He is completely bed-bound. So I want to spend a little longer time with him. I will be back to US in February 2013, then I have even more workshops booked for the coming year. I will see you again. Just like my last trip in Beijing, I will keep you posted and let you know what I see, do, and think. I went out this morning. It is very cold here. The temperature is -3 degree Celsius (about 19 F). The dominant color here is grey, very grey. However I see an orange vender has placed a high chroma color on the grey background. This photo was taken at the beautiful Sedona. The last glimpse of the sun painted the majestic Cathedral rock with burning colors. I felt the temperature is dropping, and the night is approaching. I have to say good bye to this fantastic place. Although the day and night are alternating, the person comes and goes, the the beauty is everlasting. Recall my journey of 2012, I feel satisfied. It has been a very busy year, and time goes by so fast. I can’t believe it has been one and a half years since I have left my full-time engineering job. I feel I am a little bird flying all over, bringing worms to Mom Bird and Baby Bird. Our small nest in Austin is still in good shape. Ray tracing my zigzag path across the United States this year, I have perched at Houston Texas, Scottsdale Arizona, Sacramento California, Melbourne Florida, Putney Vermont, Albany New York, Cypress Mill Texas, Atlanta Georgia, San Francisco California, Marshfield Massachusetts, Newport Rhode Island, Jacksonville Florida, Montgomery Alabama, New Braunfels Texas, Wethersfield Connecticut, Magnolia Texas, and Sedona Arizona. Oh boy, that is a lot of travel. I have some significant improvement in my art, especially the two months study at AAU. It opened up my vision, and I know I have more areas need to be improved. I have realized that my beginner’s luck has started to run out. Wether I can stay in the art field will be only determined by courage and tenacity. I have been trying new things. Some of them may not always benefit me, but I have to do it to find out. Challenges are a part of life. It is so often we don’t know what to do. However, we have no way out, except keeping on going. Now, I am sitting at San Francisco International Airport waiting for my long flight across the Pacific Ocean. I am on my way to Beijing China again. My art travel goes to a new phase. I will keep you posted from the exotic Orient. Goodbye America! "Demo at Sedona 2012 2"
Now I have finished my very last workshop teaching of the year. Under the crispy sun light, the red rock of Sedona reflects dazzling color impinging on art journey of 2012. I am on my way home. This is my second demo. I am getting looser and thicker. I have a long way to go with my high key approaches. Can't wait to progress more. “Demo at Sedona 2012 1"
I want to thank Sedona Arts Center for organizing my workshop at this super beautiful place. I want to thank artist friends from all over for attending. This is my first demo. It is always a challenge to figure out a setup and finish the demo within two hours. I really like the copper and lemon. It is too too too beautiful, Sedona AZ. I arrived last night. I have gone anywhere. This photo was taken from my hotel room. Another portrait study from my AAU time. This one is one of my favorites. Zhaoming mentioned in his class. Portrait painting is different from head studies. If you concentrate on how to get the anatomy, perspective, lighting, and modeling correct to make the face look human, you are only doing a head study. Painting a portrait has to go beyond the head study level, the artist should concentrate on the personality, mental and emotional characteristics. I feel this painting has started to show some portrait qualities. I am happy about that. For a while, I have been working on improving my art, so I did not take care the business part of my art. I feel a little hungary now. Tomorrow I will go to Sedona AZ to teach a workshop. I am very excited about this one. BTW, I made a mistake on my calendar button on my painting emails. Know I have fix the error. It should be working now. Finally, I finished my long term painting "Awakening". Since the painting is semi-dry, I can't get a good photo. I got a ton of glares. Doing a large painting is so different from my small daily studies. I go a way deeper in designs and paint effects. My AAU study during the summer has really laid the foundation for doing large paintings. I like the light effects and light consistency of the painting. I really want to do more projects like this. It gives me more opportunities to deal with detail modeling and dramatization. I consider to submit this painting for the 2013 OPA show. I missed this year's show, so I want to be prepared a little earlier. I have not done any small paintings for a while, but I hope I can pick it up soon. Life keeps on going. Problems are inevitable, but if we do not give up, we will be there eventually. So, I don't want to talk about my demons any more. I am awakening gradually. I am still working on my long term painting, so I show another portrait study I did at AAU in the summer time. It used two light sources: one warm and one cool. Recently I started a discussion about demons. So many friends sent me great comments. They helped me a lot and warmed my heart. Thank you so much. But what is the “demon” I mean specifically? As a matter of fact, it is the paraphrase I use to refer the problems I ran into during my personal development. They are not horned monsters that my son trying to kill in his video games, but it is true that they are the power from the dark side. They have many appearances. Today I just want to talk about one of them - my fear of unknowns. Since I left my engineering job. I have given up the security and stability. I know I have to face the anxiety of the unknown future. It force me work harder, and try to accomplish as much as possible. I tend to work too much. I have difficulty to relax. I try to take all the opportunities. However, that starts to take away all the fun and freedom, which are my original objective of departure from a meaningless job. How come I turn my dream into another job. This is all because I have this demon in me. It shows its ugly face and sharp fang, waving his bloody claws trying break me into pieces. However, it is too often, I forgot this demon was created by me. You know well that I want to be a good artist to share the world beauty with you. However, only I know I am an even better artist that I created the most fearful monsters to scare myself. Now I am learning to accept my demon, because it is me. I am learning to meditate with him. Learning to use the most powerful weapon to conquer everything. As I mentioned in my previous post, I have been working on a long term painting project. Instead of showing the final result only, I decided to share the process with you. The project is the continuation of my calligraphy/still_life painting I started a couple of months ago. The Chinese character in the image means "awakening". I combine the calligraphy with a scene of a Buddhist shrine, since the word "Buddha" happens to mean "the awakened one" in sanskrit. Awakened from what? That is a very interesting question, but you can think about when you have time. This painting is relatively large: 18" x 24". I have spent five days on it already. I work only several hours each day on it, since I have so many other things on my plate. I have to spend long hours dealing with the demon in me as I talked about previously. Thanks to all of you who wrote me wonderful comments on my battle. We will talk more on that topic later. With this painting, I used a very different approach. I don't have a fixed setup. I design the light and value in mind first, then found representative objects to form the scene. I combined painting from life and using photos. I altered freely the sizes of objects according to my design. I used computer graphics to simulate the effect so I can visualize the result before I paint it. As a matter of fact, the image you see today is not a pure photo of my painting. The calligraphy is an overlay to show me the effect. With this approach I can set up the still life on canvas directly and gradually, instead of having a fixed setup in my shadow box. I did a way more thinking than push paint. With this approach I gained more freedom. I can vividly put on canvas objects which do not exist in the real world. Now this painting has began to show the effect I wanted. I am creating an illusion in front of you. However, my intention of this illusion is to help you, including myself, to be awakened from the delusion of the world, and see the true reality. I am currently working on a long term painting project. It will take me a week at least to finish. Since I don't have any new painting to show you, I will share some of my old work. This is one of the portraits I did at Academy of Art University (AAU) in San Francisco in July. I was there for two months in the summer. AAU was a significant eye opener for me. Since then, I have been very sure what to do to be an good artist. After I came back, I made a plan to pursue my study. However, I worked according my plan only for a short while. Then I quickly found out that I have to stop most of my rigorous approaches. I ran into so many difficulties, some of them are physical and Psychological. Now, I am still going, but much slower. I have seen significant fragmentation in my art development. From this a couple of years of my art journey, I realize a philosophy. I don't know how true it is, but I want to share it with you. Here is what I found: When I started a new career, I also planted a evil seed in me. This seed will grow into a demon as my career grows. Most of the time this demon will over grow (especially, if the career is some sort of "business"). Soon after this demon is strong enough, it starts to destroy me. I have spend more and more time to fight my demon. Obviously, the growth of my career slows down. If I am not careful, the demon will easily destroy me. It has happened to so many people in history. Have you seen the life of many so called "celebrities"? I surely hope I will not become another victim. So having the awareness of this demon exist in me is the first step. Secondly, I need to have infinite patience (Yes, INFINITE), and fighting (no, living with) my demon is a absolute skill we all need to have. As a matter of fact, to be a good artist is not my final goal; to be a mature human being is. I did an additional demo on the last day of the workshop at Magnolia. It was a very enjoyable experience of doing this one. I have almost finished my workshop teaching for 2012. I have one more to go and I am very excited about this one. My final workshop will be held at Sedona, AZ, a beautiful beautiful place. The date will be on Dec. 4 - 6. We still have a couple of openings. I know most people are busy preparing for Christmas, but just in case if you have sometime, please join me at this spectacular place. If you are interested in attending this workshop, please contact: Sedona Arts Center. This is the second demo I did in Magnolia. I hope you like it. I am back to Austin now. Life goes on. Time goes so fast. Now the holiday season is just around corner. I have used 13 of my painting images and made a desk calendar for the coming New Year of 2013. Please click here to see the images in the calendar. I also placed a calendar widget on my blog. Please check it out. I can't believe that the major part of 2012 has passed. This year is very important to me. It is the first year for me as a full time artist. I have experienced a lot, learned a lot. I feel very grateful to all of you who are supporting me. I am very happy I have made it so far. Thank you so much. I paused my color study and put on my teacher hat again. After about 3 hours drive, I have arrived Magnolia TX, and started another workshop. I want to thank Marty Hatcher for putting this workshop together, and Thank all artist friends for attending. In this workshop, 50% students have taken my workshop before. Some of them have taken 3 times. I feel so grateful that so many friends are supporting me. That gives me more confidence to keep going, even my art learning path is not as smooth as I wish. Thank you all for taking care of me. This is the first demo I did. It is low key and has a lot of light. "Demo to My Tuesday Class"
This is a demo painting I did to my Tuesday mentoring class. I am sorry I feel a little low today. After I came back from New England, I thought I could continue on my color study. However, I have encountered so many side tracks, and I can't concentrate on anything. I understood more now that if you want to be an artist, you must hold on to your dreams. Even you hold on to it, there is always more than enough barriers and challenges trying to break you down. You fall so often, you feel exhausted always. So many have given it up already. Only the one can get there who keeps on going no matter what. So "Stay Foolish" is the key. I cultivate my land, but do not anticipate the harvest. After a long pause, I resume painting in my studio. If you read my blog posts, you know I was studying the color of purple. So I am continuing from where I stopped. I got this beautiful purple sugar bowl from Keene, NH after I visited Vermont. The green bottle was given to me by one of the Putney painters. I spent quite a long time on this painting, but I felt happy about how it turned out. Finally I am able to use purple as the color for the center of focus. I feel more comfortable with this kind of high key approach now. Another thing I want to mention today is I found a new tool to hold my canvas or panel. It is called the canvas & panel gripper designed and made by an artists friend Connie Nobbe and her husband Jeff. I have used many kind of easels. The mechanism of holding canvas always block small parts of painting area. I have to move my canvas over to cover those dead spots. However the new canvas gripper do not have this problem. If you are interested in this new tool, please click the link above. I also have an ad on my blog. "Can Color Temperature be Quantified"
It is beautiful today in Austin: sunny and 86 F. After several workshop teaching in a row, I came back to my color research I left weeks ago. After reading my notes, my attention has been brought into the issue of "color temperature". We talk and think about color temperature all the time. For instance, painting shadow warmer when we have cool light. However, the color temperature in art seems so relative and confusing, especially when we deal with greys. To my limited knowledge, I have not seen anyone assign a number to a specific color. But I think number is important. Can you imagine the meteorologist in TV only tells you that tomorrow will be cooler than today, but no specifics? I think that the number "86 F" does give us more information, doesn't it? Since I don't have a quantified system for color temperature, I have to invent the wheel myself. I wrote myself a tech note as the following. (If the terms are too techie to you, please ignore them at this moment, I will share them again with more understandable words in the future after I get all bugs removed). 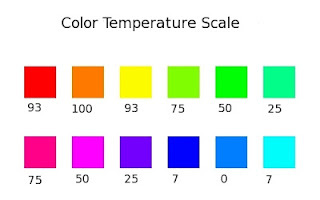 T = 50 + (S/2) cos (H - Hh), where Hh = 30 is the hue value of the warmest color. The image above is an example of the calculated temperature of 12 selected colors. I hope they make sense. The portrait study I posted last time was done at Putney Vermont. After my Wethersfield workshop, I drove up to Vermont and spent a wonderful day with the Putney painters, especially the legendary art masters Richard Schmid and Nancy Guzik. I am learning as a sponge, and looking for any opportunities to get close to great artists, so I can progress a little faster. I feel so fortunate that I get chances to learn from the best. After some insignificant delays (compared with many got stuck by Hurricane Sandy), I made it home to Austin late last night. I hope all my friends in New England are OK. Please be careful. The weather will be bad for several days there. From Alabama to Connecticut, I did three workshops in a row. I was pretty tired, but I just can't let any chance of learning passing me. I did this portrait sketch on Saturday. I will let you know more about this event with my next post. I am sitting at Hartford airport. The loudspeakers are announcing cancelation of multi flights. Hurricane Sandy is on the way to New England. I heard that some strange weather called "Frankenstorm" is forming. I am lucky that my flight is still going. I should be seeing my family shortly. I feel I am very fortunate, as a traveler and an artist. People around me are so friendly and supportive. I get great opportunities of seeing beautiful scenes and chatting with wonderful people. This is my second demo on my workshop at Wethersfield. Thanks to all the artists for making this event happen. I really enjoy coming to New England the third time this year. Trying to capture the last glimpse of the dazzling New England foliage. I have arrived at Wethersfield CT yesterday. This morning I started another workshop teaching at the Wethersfield Academy for the Arts. I want thank Betty Standish and Sandy Wakeen for organizing this workshop. Thanks to all the New England artists coming and painting with me. This is my first demo. Recently, I have so many workshops back to back, and I have shown all my demo work. I hope you are not tired of those paintings. They have similarities, but they are not all the same. I am learning every time when I do one. "Demo at New Braunfels 2012 3"
Well, I don't know I should call this painting a demo or not. I did this one as a way to improve my teaching. I asked all workshop artists paint along with me so they can get familiar with my approaches step by step. The reaction is very positive. I will involve this way of teaching in my future workshops. Now, I am back to my studio, and taught a couple of children's art classes over the weekend. Tomorrow I am on my road again. Nowadays, my life is so dynamic. I started to lose track where I have traveled to. It is a busy life, but it is good life. I wish I have started my art journey a little earlier. I would have more energy and more potential. So if you are also want to follow your heart and chase your dreams, do it as soon as possible. Do it Now. Yes, I am talking to YOU. As usual my second demo involves flowers. Because I didn't provide enough water to my models, they did not last long enough. I tried my best to give them a healthy look, well they just barely made it. Nevertheless, I felt very happy about the silver pot in the back. I have arrived at New Braunfels, TX yesterday afternoon. Another workshop started this morning. I want to thank New Braunfels Art League, Cindy Capitena, and Gaye Sekula for putting this workshop together. Thanks to all attending artists from all over. We have so many interesting props. I selected a few and did this demo. It was really fun. Upon everybody's request, I did a third demo for the workshop. This one is high key. High key provides me more opportunity for color. Have you seen the dance of warm and cool? I have really enjoyed the southern hospitality at Montgomery, and got more southern accent in my English. I came back yesterday, but a few hours later I will be on the road again. I will tell you where I am going at my next post. As usual, my second demo was showing how to paint flowers. I had a rather aggressive setup. I was a little concerned if I could finish the demo before lunch, but the result was pleasant. I felt satisfied with the two demos I did so far. My recent study of color designing has definitely shown positive effect on these demo paintings. Hello from Montgomery Alabama. This is the first demo painting I did on my 3-day workshop here. I want to thank Sybil Dees for her wonderful job of organizing this workshop. I was so moved when I saw her meeting me at the airport on a wheelchair. I admire her courage and determination in carrying out a superb job under the condition of facing significant personal challenges. In this world of art, I am so privileged of meeting so many wonderful people. I have learned much more than I taught. I feel so humbled and grateful. I am so excited seeing a few old friends and meeting many more new friends here. Thank YOU-ALL so much for attending my class. Now I resume my color study. This is my third attempt to establish a color scheme for purple. In this painting I use yellow to establish a complementary scheme with purple, since I have understood that high chroma for purple is very difficult to achieve. The highest chroma of the purples is only 43, but it looks pretty intense due to the contrast with the yellow. I didn't use any cadmium yellow colors. What you see here are yellow ochre and naples yellow. I deliberately keep the chroma of the yellow low, so the purple will stand out more, but I find out during my color mapping that even yellow ochre has a very high chroma (95). I feel better with this painting than the two I did before, but I need to go further. After about two weeks of color design study, I decided to take a break. I did this painting with my usual approach. I took off my ice skating shoes, and walk normally. I hope I can bring more enjoyment to you as well. I need some time to breath in, and breath out. Calm down and relax. The journey of art keeps on going. So please enjoy the process. BTW, I do have question: Is there a color very very dark but opaque? I would appreciate if you let me know. Thanks. This is my second data point for purple. Analogous is my color scheme and main color is purple. I understood now I can't tint too much from the tube color if I want to keep the chroma high. So I select a dark purple object. I used dioxazine purple. After the painting I did a color mapping (that is the color analysis tool I developed a week ago) on it. I found that the chroma of the tube color of dioxazine purple is not very high (63 out of 100). The slight tinting I did decreases the chroma to 55, which is very similar to what I did in my previous purple study. I am still not there yet, but I surely know more about purple now. Here is the other painting I did two days ago. Since I am in blue (as matter of fact, I am a little blue in mood lately), I want to talk more about this color called "cyan". Many years ago when I was just into oil painting, I learned a little bit about color. I was told the red, yellow, and blue are primary colors; orange, green, and purple and secondary colors; red/green, orange/blue, and yellow/purple are complementary. You get grey if mixing the complementaries together. Now I find out this color model is so WRONG. I can guarantee you will not get grey if you mix those "complementaries". In Munsell color wheel, there is no color orange. Now I use the computer HSV color system (similar to Munsell), The six base colors are red, yellow, green, cyan (or turquoise), blue, and magenta (or purple). You see orange is dropped, and cyan has been added in. These six colors are evenly distributed on the color wheel. In other words, each of the pizza slide of these six colors are equal in size (60 degrees in angle). If we use the old color system, the orange slide will be very narrow, only 30 degrees, while the blue slide will be very wide (120 degrees) if we think cyan belongs to blue. With the HSV system the complementary pairs are red/cyan, yellow/blue, and green/purple. Now you can make greys, not mud. "The color of blue 4"
Yesterday, I did two paintings. Here I just show one to you. I revisit the color blue (turquoise or cyan to be more accurate). Now I understood that I can't tint too much the tube color if I want to keep the chroma high. So this will limit my leverage of value change. Pthalo turquoise is very dark color, but I want to show lighter value, what should I do? With my first painting, I used analogous scheme, and high value background. It didn't work, because I have to tint the turquoise a lot. The color got bleached. The second painting showing here works I think. I did two things. I made background darker, so the value of blue object does not need to be too high. Secondly, I used complementary color scheme to enhance the color contrast. Even the chroma is not very high (chroma = 79, (100 is the highest)), but the complementary scheme bushes it up. Because I am concentrating on color scheme and harmony lately, I let the composition go. My painting may be too simple and not exciting artistically. This painting is very modern looking. But I am not crazy. I will win your confidence back. The study is going. With this one I worked on the color purple. This one has some problems. I want the purple color to be high in chroma, but it didn't happen. If I tint the color, the purple is very quickly lose its chroma (or intensity). I was using quinacridone magenta. Most of the purple colors are dark (low value) if you use them directly out of the tube. If you know a mid or light purple with intense chroma, please let me know. Thanks. My color design study has gained more momentum. In this painting my main color has shifted to ultramarine blue. The color scheme is still analogous. I want to stay with analogous scheme to guarantee the color harmony. I feel it is working. I will exercise more to become more skillful. This my second try on doing a color design with blue. The color scheme is still analogous. I minimized the use of yellow. There are two blue I used: on the bottle I used phthalo turquoise, and on the background and the small cup I used ultramarine. My camera has a limitation. The turquoise color is not showing as strongly as the painting showing. I feel much better about this one. I have to say I am doing a very left-brain dominated research right now. Each of the small painting I do recently is one data point for me. Song (my wife) is very concerned about me. This exercise may hurt my business (it is very scary). I have moved away from my usual style, and put on many restrictions on me deliberately. Many of you might have similar concerns just like Song does. Why are you doing this? Qiang must be crazy now. Well, my explanation is: what I am doing now just like a person want to learn ice skating. I know how to walk, but I deliberately put on those weird shoes with blades underneath. Now I can not walk. I even don't know how to stand. I have to start with baby steps. That is the hard time I am giving to myself now, because I know I will have more freedom in the future. I think I am giving myself a hard time. I force myself not to use red and orange colors for while, I want to see if I still can paint good paintings. My newly developed color analyzing tool has shown some use for me. The color scheme of the this one is majorly analogous and slightly complementary. The center of focus is obvious. The blue does stand out, but not strong enough. Now I need your help: how can I make this color scheme more exciting? Oh! I just got a thought, I am going to do a Daily Paintworks Challenge, so you can show me a couple of things. See you on DPW. I have been doing a serious study on color harmony for a week. It is one of most important topic in graphic design. In this painting I used the analogous color scheme. I am trying to develop a tool on my computer to analyze the color design of any arbitrary painting: I run a filter to get a simplified version of the original image (to mimic the effect of squinting). Then I sampled a set of colors and get their corresponding hue, chroma, value figures. Then I map those colors on the color wheel, and the grey scale. From the distribution of the colors, I can know the painting's main color, color scheme, color dominance, value dominance, and value range. With this method, I can quantitatively understand the design of any artists including myself. Please see an example of my analysis. In the future, I will develop an app, you may put on iPhone or iPad. If you know someone doing the similar thing, please let me know. I might have reinvented the wheel. I am painting again. The time between this one and my last painting was about a week, so I am not qualified as an daily painter if I keep doing this. I did a lot of thinking lately. A couple of years ago, I don't think too much when I paint. "JUST DO IT" was my spirit. But nowadays, my art has reach to a bottle neck. I saw problems in my paintings. I can't stand when I see some of my old work. I am learning proactively, and feel overwhelmed. I must control my desire, and reluctantly pause something I really want to do (like figure drawing and painting). Now in still life, I have decided to do high key and colorful small paintings, and my dark background paintings for only large paintings. I also start to put away some of my general principles like "painting the light, not the object", and "use large area muted color to make the color at the focal point sing". I am working more on graphic design concepts, which I don't know enough about. I am trying new approaches, even approaches I don't have strong believe in. My today's painting is not my usual style. Someone may think I am going backward. No matter what, it is just an experiment. "More thought about teaching art to children"
I did two children's art classes yesterday. This image is a drawing done by my son Jonathan (15 years old). Since my post of last week talking about teaching art to children, I have received many artists friends' comments and emails. Many of them provided me information of website links of art teaching projects. I want to thank all of you for supporting me and help me out. I have been googling and try to find appropriate projects that I can use to beef-up my curriculum. I am sorry to say I have rejected most of them from the Internet and ended up creating most of the projects by myself. Personally, I feel the current art education has over emphasized too much the importance of the Impressionism and the modern trend. So many projects online try to teach kids how Van Gogh and Warhol paints. I have not seen any project teaches how Da Vinci, Rembrandt, Bouguereau, and Sargent paints. For those artists, art education can only talk about them as a part of history lessons. I really believe this kind of representation art is teachable if the teacher arrange the projects properly. Those are the projects I would like to involve into my curriculum. I understood that most of children love to draw during their kindergarten, elementary, and part of the middle school. However most children conclude they can not draw when they are around 12 years or older. The reason is they see more and more around them, but feel frustrated with their art skills. So most people give it up. As a matter of fact, that is exactly the time, art teacher can really help. I am happy to see many of my young students making progress. You haven't seen much of my painting lately. Well there are many thing to talk about that. I will get back to you soon. This week I was called back by my previous engineering company to work on a technical project. So I tried the old routine I had when I was working full time, i.e. working in the day and painting in the evening. So I painted this small painting last night, but I felt very different then before. Instead of concentrating on creating art, I was fighting to myself to keep going. I was so tired. My energy level was significantly lower then before. At many points, I almost gave it up. I just wanted to go to bed. I reluctant to accept that I am no longer a young man any more. To many of you my friends, I have no right complaining about aging. But I understood now that I am confronting the challenge of life itself. Oh boy! Getting old is not for sissies! I don't have a painting to show you, but I want to share what I am doing for this a couple of days. I have not mentioned much in my blog that I have art classes in my house, most of the students are children from 5 to 16 years old. In order to teach kids art properly, I did a lot of search on the Internet, but I was very disappointed to find out that there is almost nothing I can use to guide children to gain hands-on skills and knowledge about art. I asked some of my young friends in both elementary and high schools if they have art classes in school and what they have learned. They said they do have art, but they hardly learned anything. It is a sad reality that art education, in America as well as in China, schools only teach how to talk about art, not how to do it. I feel sorry to our kids, and I will try my best to help them.